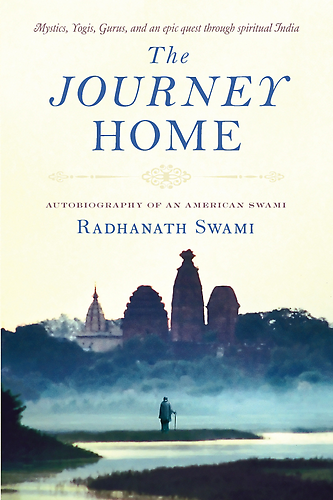 When I first came to India, I was about 19 years old. I am just now remembering my first day in this great country. In the evening I was walking down the street in old Delhi, chandani chowk area and one very polite gentleman approached me on the street and asked me, “Where are you from? Why have you come to India? What is your educational qualification?” and then he asked me, “Have you had any food?” So he brought me to a restaurant. As we were waiting, he ordered for me because I did not know anything about India. It was an open restaurant. Just a few feet away from me on the road, – there was a mother cow and her baby calf. I had never been so close to a cow in my whole life, because in the United States of America, the closest a normal person comes to a cow is seeing them in the pasture grazing, some distance away, while you are driving down the highway. This cow was so beautiful: her eyes were shining, so big, really like lotus petals, very graceful. Her little calf was one of the most beautiful people I have ever seen in my life, so innocent, so life loving. The calf was playing and the mother was so very carefully and lovingly taking care of her little calf: feeding her milk, licking her. It was really a relationship of love. For the first time in my life I made the connection – to eat this meat means a cow like this and or a calf like this, that loves their life, and who loves their children, as much as I love my mother perhaps, they are killed. I was shocked. I was twenty years old. I never made the connection before. I began to cry; I couldn’t eat. My host looked at me like I was crazy. He said, “What’s wrong?” I was speechless. I began to reflect that this is the power of habit. Years later, when I came back to America, I was explaining to people, my relatives, my friends, “Don’t you see the connection?” They could see the connection and they could understand it. It is just common sense. You love your dog, practically as much or more than your other family members. If a dog of an American dies, or a cat, they weep and cry for days in separation as a person that they love is dead. Can’t you see that the cow and that calf is a mother and a child, who love their life and love their family as much as you and me. They could understand! It is a common sense, but due to habit it just would not sink in. They have been conditioned from birth to this eating meat. Srila Prabhupada has said that one must be clean in heart and habit, in order to understand spiritual truth. Man is a creature of habit and we can change our habits with practice. 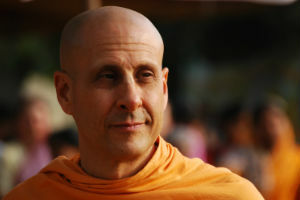 4 Responses to "My first day in India"
The whole world takes on new shades and tints when we see it through Radhanath Swami’s eyes. Shades that would otherwise elude us. His words open our eyes and unlock our hearts. Prabhu ji Namahskara and seeking your blessings. Obeisance respect to you and for your realrealisation of Mankind. Your realisation during your first visit to India about the motherly hood of cow and love towards her baby calf is very very greater than anything in this world. This type of intuitions are possible to One only through the ideas of Mind under the shelter of Intelligence which recalls and regains the contemplation of GOD in previous birth for further accomplishment ; And will attain greater salvation As LORD said in BHAGAVAT GEETA 6-43 & 44. Your realisation shows that all the living beings are interlinked with each other and only the perfect humans can be able to realise like you. Humans are known for Manly kindness; but in ignorance of this Nature Humans become conjoin with demon nature of habit of killing animals for meat eating. 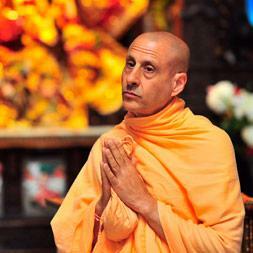 A very beautiful comment further beautifying the wisdom from HH Radhanath Swami. Thank you.